A quick stopping of an induction motor and its high inertia load can be achieved by connecting stator terminals to a d.c. supply. Any two stator terminals can be connected to a d.c. supply and third terminal may be kept open or may be connected directly to other stator terminal. This is called d.c. dynamic braking. If third terminal is kept open it is called two lead connections while if it is shorted directly with other stator terminal it is called three lead connections. A diode bridge can be used to get d.c. supply. The Fig. 3(b) shows two lead connections with a diode bridge for a d.c. dynamic breaking of an induction motor. When d.c. is supplied to the stator, stationary poles N, S are produced in stator. The number of stationary poles is P for which stator winding is wound. 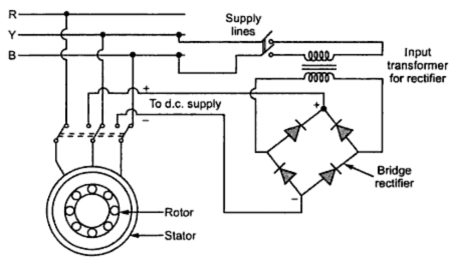 As rotor is rotating, rotor cuts the flux produced by the stationary poles. Thus the a.c. voltage gets induced in the rotor. This voltage produces an a.c. current in the rotor. The motor works as a generator and the R losses are dissipated at the expenditure of kinetic energy stored in the rotating parts. Thus dynamic braking is achieved. When all the kinetic energy gets dissipated as heat in the rotor, the induction motor comes to rest. 1. The heat produced is less compared to the plugging. 4. Quick stopping of the motor is possible. 5. The method can be used for wound rotor or squirrel cage rotor induction motors. This Φ is less than 90o for the motoring action. If the rotor speed is increased greater than the synchronous speed with the help of external device, it acts as an induction generator. It converts the input mechanical energy which is given back to supply. It delivers active power to the 3 phase line. The Φ becomes greater than 90o. the power flow reverses hence rotor induced e.m.f. and rotor current also reverse. So rotor produces torque in opposite direction to achieve the braking. As the electrical energy is given back to the lines while braking, it is called regenerative braking. The arrangement for regenerative braking is shown in the Fig. 4. Note : The active power delivered back is proportional to the slip above the synchronous speed. The slip is negative for such operation. 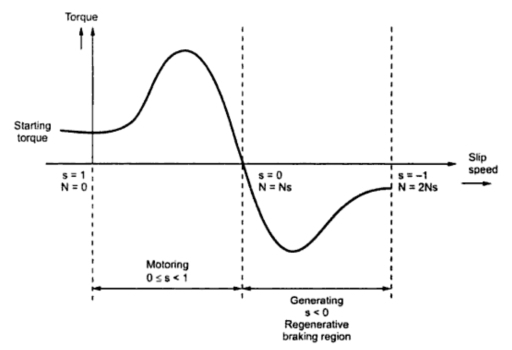 The torque-slip characteristics for motoring and generating action is shown in the Fig. 5. The main advantage is that the generated power can be used for useful purposes. While the disadvantage is that for fixed frequency supply it can be used only for speeds above synchronous speed.